At the message of the Archangel, Gabriel, the Virgin Mary received the Word of God (Jesus) in her heart and in her body, and gave life to the world. 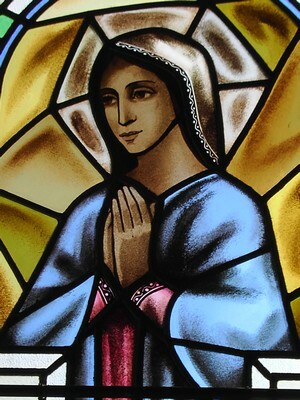 Hence she is acknowledged and honoured as being truly the Mother of God and Mother of the Redeemer (Lumen Gentium, 52). In order that this might happen, Mary was conceived free from Original Sin in the womb of her own mother, St Anne, through a special privilege. First, that Mary is Ever Virgin. Second, in 431 A.D. at the Council of Ephesus, the primary title of Mary as Mother of God (Theotokos) was sanctioned. Third, on December 8th, 1854, Pope Pius IX declared The Immaculate Conception, that Mary was conceived in the womb free from the effects of Original Sin, to be part of the Deposit of Faith. Finally, on November 1st, 1950, Pope Pius XII declared The Assumption, that Mary at her death was assumed body and soul into heaven, to be part of the Deposit of Faith.